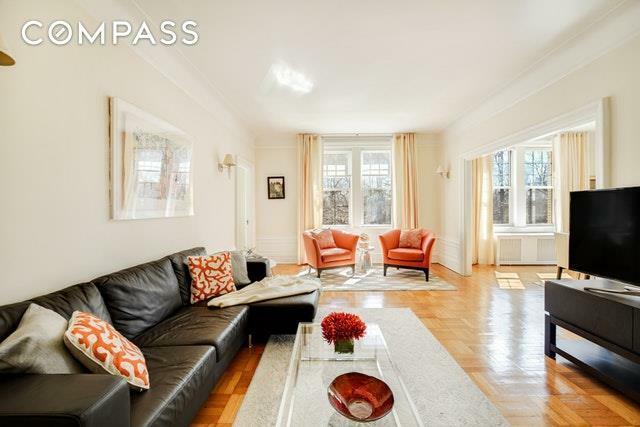 Apartment 2B at 125 Prospect Park West is a sun filled, elegantly laid-out 2 bedroom corner apartment. 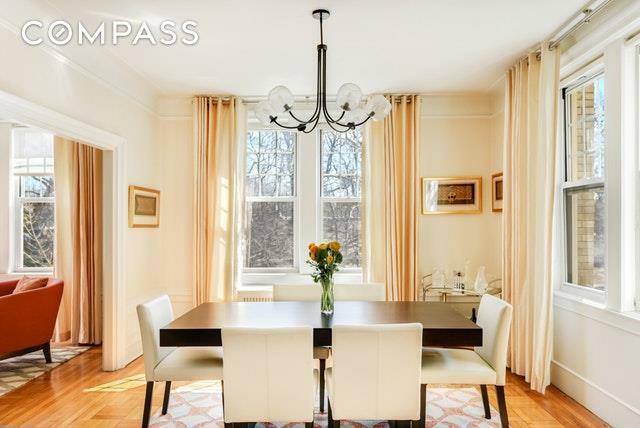 It directly faces Prospect Park and is in a pre-war, elevator building in prime Park Slope. Located on the 2nd floor, the apartment is accessed either from the elevator, or up one flight of original marble stairs with stained glass windows illuminating the space. A gracious foyer greets you upon entering the apartment, with space to drop your bags and coats. The hallway from the foyer opens up into a grand and light filled living space. Seven large windows wrap around the living room, dining room and kitchen letting light stream in and fill the apartment with warmth. All windows face Prospect Park, with a wall of blooming trees in the spring reminding you of how close NYCs best park is. The living and dining area is open and spacious allowing for a gracious flow throughout. From every room and every angle, there are views of open skies and greenery. The space is perfect for entertaining, whether hosting a formal dinner party or a big family Thanksgiving Day meal. The kitchen is open to the dining room and features natural stone countertops and backsplash, a large kitchen island, stainless steel appliances and a large pantry. Separated by the living room, are 2 large bedrooms and a windowed full bath. The master bedroom is large and inviting and features a fabulous, custom built walk-in closet. It is tucked away in the corner of the apartment, making it the perfect nightly retreat from the homes living space. The second bedroom, currently being used as an den/office, has an oversized window overlooking the park and 2 large closets. 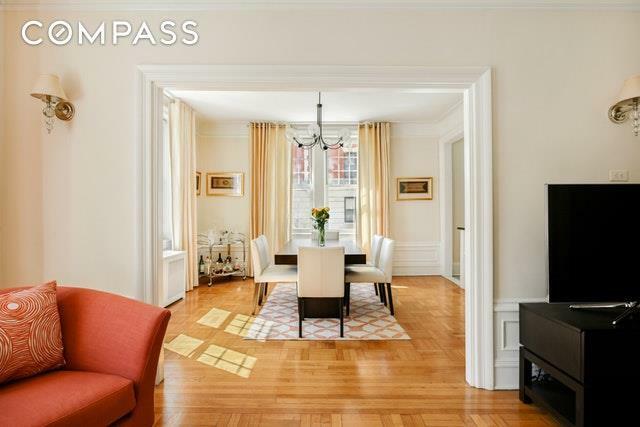 Beautiful original details and Parquet floors span throughout the apartment. 125 Prospect Park West is a well maintained, professionally managed and pet friendly elevator building. There is private storage in the basement, a large central laundry room, a live-in super and bike storage. The lobby is spectacularly maintained with a large sitting area, immaculate original details including leaded glass windows, marble banisters and a decorative fireplace. 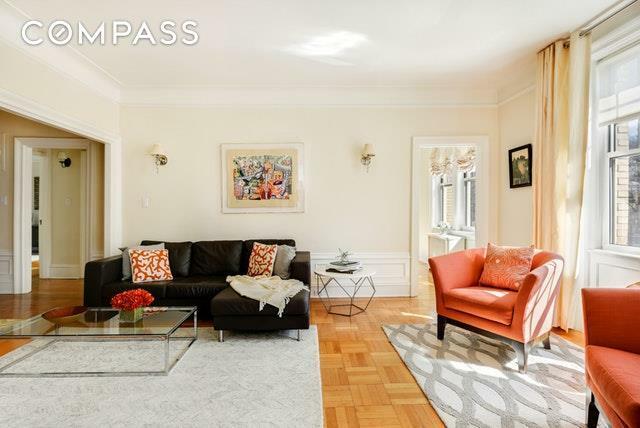 Located right across the street from Prospect Park and a few blocks to the nearest subway, great eateries and boutiques, the location can't be beat! Listing courtesy of Maria Ryan of Compass.